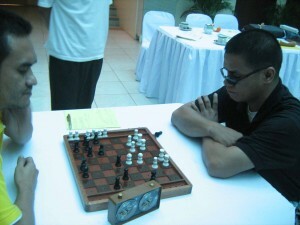 OIC Matt Lee, Jr. welcomed and cheered the 6 Visually Impaired chess contenders for the IBSA World Elimination Round held at the NCDA last Friday February 11, 2011. Led by Coach and trainor Grandmaster Rogelio M. Antonio, Jr., the goal was to choose 2 winners for fielding in the upcoming â€œ4th International Blind Sports Association (IBSA) World Gamesâ€ slated in Antalya, Turkey on April 1 â€“ 11, this year. NCDA focal person for Sports Nanie Apostol also announced that the two winners joining the IBSA World Games will represent the country in the â€œ6th ASEAN Paragamesâ€ in Indonesia in December 2011. 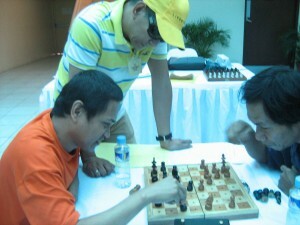 For the elimination round in NCDA, arbiter Sandy Angustia used a double round robin that gave the players a two-time opportunity to prove themselves. See the final elimination round results below.